"IIR is based on investment projections of Sponsor and as provided in the PPM for the investment. Results may vary due to a wide variety of factors." OK so that seems fair and they're at least saying that the 19% is just their projection and its not guaranteed. So this seems more like a relatively high risk investment and not an outright pyramid scheme style scam. I went to the website they listed on the page and found that its actually an investment offered through the RealCrowd site. RealCrowd is a crowd funded real estate company. For more on the topic see Crowdfunding Real Estate from CNBC. Probe a little on the Real Crowd site and I see that only accredited investors are allowed. Thats a good thing. It means that you have to have piles of money sitting around that you can afford to lose it. Just kidding. But really it means that you have to have piles of money sitting... oops, I almost said the same thing. Accredited investors have to have a minimum income level of $200k a year / $300k if married for 2 years OR have net worth over $1M excluding your primary residence. My wife and I don't happen to fit that description so I guess we're losers who have to sit on the benches and watch the rich people make 19% while we make due with our 0.01% savings rate. How mean of them to tease me with this fabulous investment opportunity but then say I can't play because I'm a poor kid. Given that the investment is on RealCrowd this makes it seem much more legit to me than some random postcard claiming 19% returns. 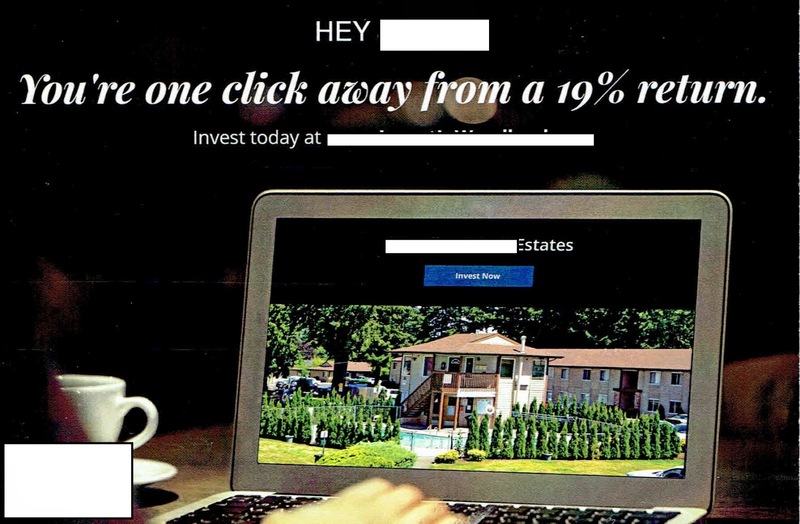 But are advertisements for 19% returns really ever legit? (at least in this current market) Is that even possible? I found the actual property for sale on Loopnet.com and I can use the info there to estimate the financials. The property is actually just about a 2 mile drive away from a rental that we own and recently rented out after a vacancy so I've got some direct experience and recent with the market in question. Lets say they expect to spend an average of $10k per unit to fancy the place up then jack up rents by $200 each. That means the total investment is now $3.37M. The loan is now $2.696M and the down payment is $674k. But now the rents are up substantially at $466,200 per year total. If we use the same 50% ratio then we're looking at gross of $233,100. The mortgage payments are up to $154,440/yr. This gives us a $78,660 bottom line on $674k of equity. That gets you up to 11.7% return. Thats getting a lot closer to 19% but not quite. This is a realistic scenario. $850 average rents are typical for that area of town and you could probably get up to $1050 fair enough if its nicely remodeled. But pushing it much higher than that isn't very likely for an older building. OK now what if you bought the place, spruced it up and then resold it? If you can reasonably sell a place with $850 rents for and a cap rate of 6.29% then it sells at $3M. But if you also expect a 6.29% cap rate on an improved property then you'd expect the $1050 rents to equate to a sale price of $3.7M. Thats about 10% gain in equity in value after doing the improvements. So maybe what the idea here is to buy the place, spend some money fixing it up. Jack the rents up. And then after a year or two try and resell at a higher price based on the higher rents. Based on that kind of strategy I think its actually feasible that they could net 19% returns. Note I'm just guessing what kind of investment strategy they might have but I think my guess is fairly good one. You really cant make 19% return on a simple multifamily investment so they must be expecting to improve and flip the property and I assume they must be using fairly high leverage as well. If their strategy fails then that high leverage could mean big losses for the investors or at least much lower rate of return, and that is where the risks come it. I also have no idea how liquid the investment would be or if theres any other requirements involved. But the investment and potential 19% return is based on a lot of ifs and risks. There is risk involved for sure but its not impossible. I mean hey, my Dad and I bought a property $45k in 2002 and its worth $127k now. Thats 8% appreciation. Plus we've netted about $6k profit annually off the property. We probably could have realistically flipped that place in a few years for nearly a 200% return and gained 25% annual investment returns. While what my dad and I did is different than what this investment in question would do, its proof that high returns are possible on real estate given the right situation. If my dad and I could do it then I'm sure competent real estate professionals using other peoples money can do it too. 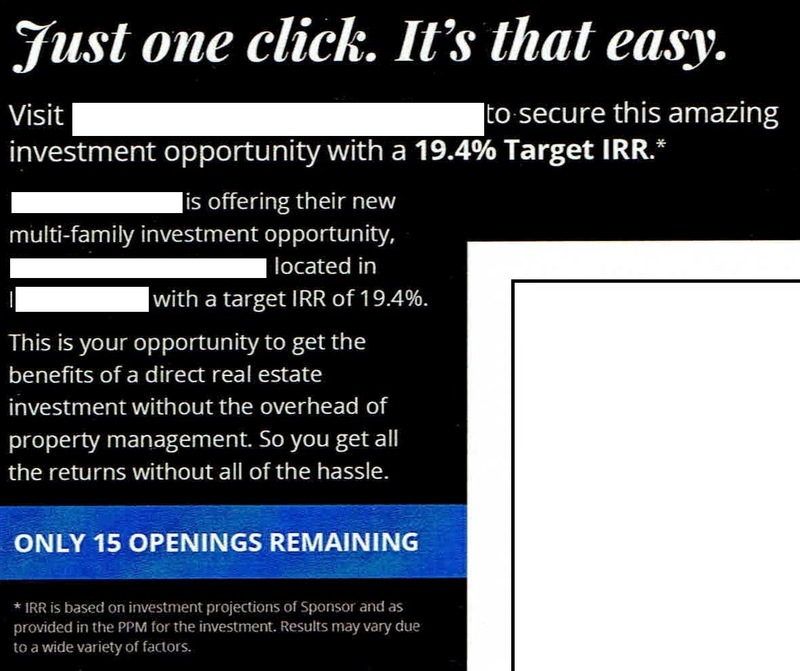 While I think 19% might be feasible I also think you should NEVER sign up for investments that you get via mass mailings that advertise high returns and have little detail. Bottom Line : A 19% return might be feasible but it would come with risks and I certainly would not trust an investment pitch advertising 19% returns received via postcard.